Starbucks announced on Monday it’s getting rid of its instantly recognizable green plastic straws. In their place will be lids that look like adult sippy cups. McDonald’s already announced a similar move and the city of Seattle has banned plastic straws and utensils. Straws are becoming a target because they contribute to ocean pollution and can be dangerous to marine life. One viral video of an injured sea turtle is credited with waking up the world to the problem. The video of a sea turtle having a straw removed from its nostril is likely to make you cringe, but the eight-minute video also went viral. “So this is the reason why we don’t need plastic straws,” said Christine Figgener, a sea turtle expert at Texas A&M University who recorded the procedure. More than 30 million people watched the video of the TAMU team working to remove the straw and help the sea turtle breathe easier. The turtle recovered, but seeing the video fueled outrage about all the single-use plastic trash that ends up in the world’s oceans. “Soon there will be more bits of plastic in our oceans than fish,” said Robin Schneider, Executive Director of the Texas Campaign for the Environment. Schneider participated in a couple of Austin area demonstrations pressuring Starbucks to phase out plastic straws. “Straws are one of the top ten items that are found in beach cleanups and often times you can tell it is Starbucks because of the green color,” said Schneider. Starbucks announced on Monday it will phase out plastic straws by 2020. The change will eliminate the use of one billion straws a year. That not only reduces waste at landfills, it could also make recycling more efficient. “They’re difficult to recycle in our local recycling stream. It is a small thin piece of plastic, it can fall through the machinery and get jammed, so it is a little bit of a problematic material to recycle,” said Gena McKinley with Austin Resource Recovery. Environmentalists are applauding the Starbucks initiative, but they say the commitment to the environment needs to go beyond straws. They say plastic lids and cups and disposable utensils also need to be eliminated. 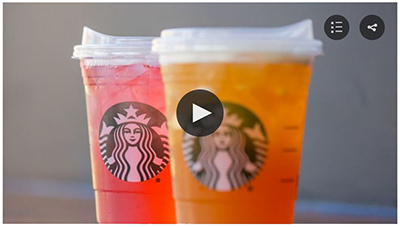 The new recyclable strawless lid will start showing up in Starbucks stores this fall. They will be completely phased in by 2020. Starbucks and McDonalds know some customers need or just prefer straws so they will be available for customers who ask, but they’ll be made of paper or compostable plastic.